What parameters can we adjust in a slingshot set up, and what will the results be? The graphs are real recoded data, collected with a shooting bench and a chronograph. Steel balls of varying sizes were used as ammunition. What happens during a shot? First, you draw back the bands. The necessary energy to do so is provided by your muscles. Some of that energy is stored inside the bands, the rest is dissipated as heat. When you release the bands, they start to contract again. 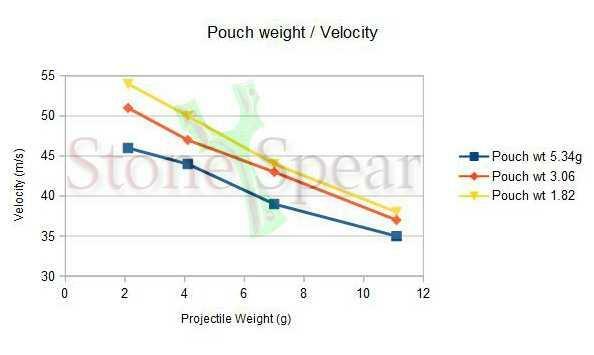 Projectile, pouch and bands are accelerated. The stored energy is distributed between said parts. The heavier your ammunition is, the bigger will be its share from the overall energy. But at the same time, your ammo will fly slower, making long-range shots much more difficult. We also need to know that a given bandset, at the given parameters, has a maximum speed (the one developed by shooting without a projectile in the pouch), and this maximum velocity cannot be exceeded, no matter what type of ammo is used. 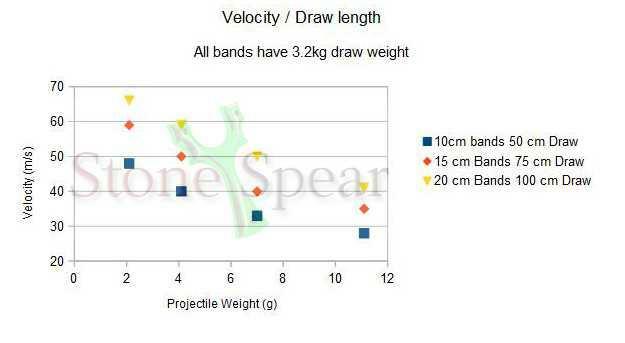 The following data shows you how changes to your band setup affect the velocity and energy when projectiles of different weight are used. Let's assume you have two rubber bands: Rubber type, band length etc. is exactly the same, but band #2 is twice as wide, and thus has twice the drawing weight. You pull both of them back and let them snap. What happens? Both bands contract at the very same speed. The big band has twice the draw weight, but also has to accelerate twice the mass. Now take a look at the graph. You see three data from slingshots using single, double and triple layered bands of the same type. When lightweight ammo is used, you get a very small difference in velocity and energy. But the gap between them increases when the ammo weight increases. 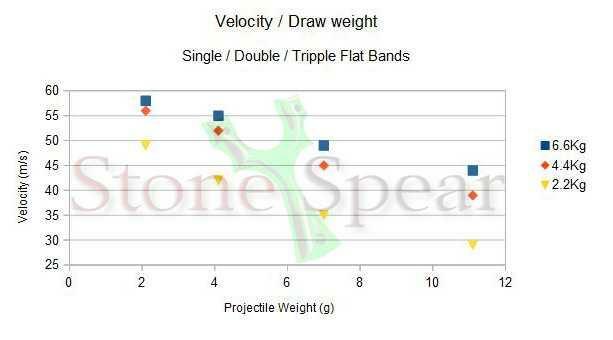 You can also see that the weakest bands are significantly slower, while the double and triple bands have a very similar velocity over the whole projectile weight range- in other words, the much higher pull weight from bandset #3 is useless unless very heavy projectiles are used, while bandset #1 already struggles to propel lightweight ammunition at an acceptable speed. Conclusion 1: Stronger bands benefit from heavier ammunition. Conclusion 2: Increasing a projectile's velocity by using heavier bands is only possible to a limited extent. You quickly reach the point where adding band weight has very little effect. Let us take a slingshot and replace the bands with two pieces of strong metal wire. We can pull as much as we want, the projectile will not leave the pouch. Why is that so? The reason is that a projectile's energy is the force it experiences form the bands, multiplied with the distance it travels. W=f*s, as you might recall from physics class. 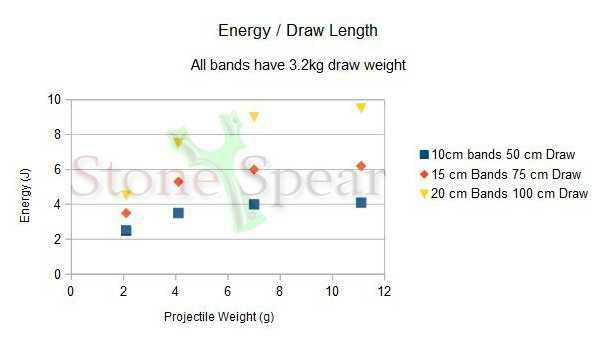 So in theory, twice the draw length gives you twice the energy, with all other factors being eual. 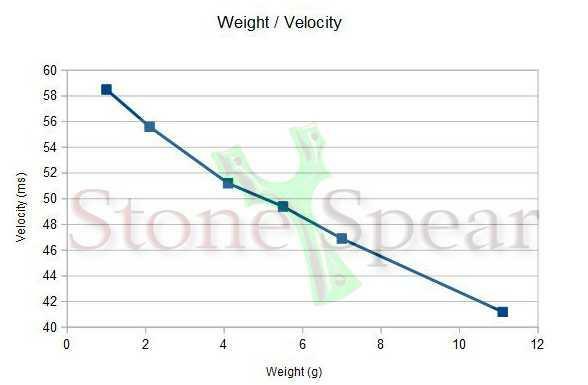 The experimental results show that a slingshot even surpasses this assuption, for reasons I am not entirely sure yet - maybe because hysteresis takes its toll when the rubber has less time to contract. Increasing the draw length does not only improve energy, but is also the best method to increase velocity. This is very important if you want a flat shooting slingshot for long-range work. Experimental results suggest a small increase in ideal ammo size with increasing draw length, but you don't have to use heavy ammo with a long draw weight. This is gives you a very high energy density - which is good for hunting - and keeps your ammo cheap, lightweight and flat shooting. Conclusion: Draw length is king. Increasing it does increase both energy and velocity, without the need for heavy ammo. There are two ways to add to your draw length: First, you can pull the bands behind our cheek. This type of shooting is called "Albatros style", or "Butterfly style". Once you master this style, you'll be amazed about the velocities you can achieve, and the distance you can hit targets. You'll also be amazed about the rate you have to change bands, as these suffer from being accelerated so much. The second method is to use a slingshot with extended forks. 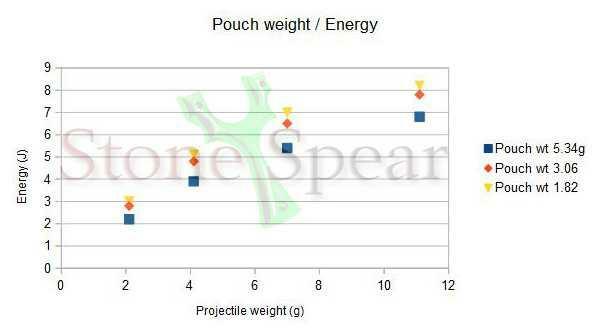 During the shot, the bands have to accelerate the combined weight of your projectile, the pouch and themselves. 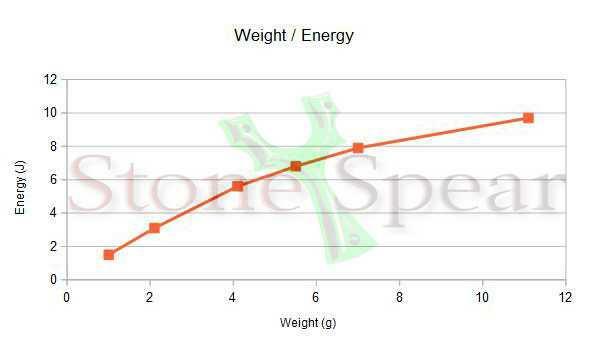 And the higher your pouch weight is, the more does it takes from overall energy. In reverse, you can diminish the (relative) amount of lost energy by using heavier bands or heavier ammunition. Conclusion:Always try to keep the pouch weight on the light side. The heavier your ammo is, and the stronger your bands are, the less you have to worry about it. A tapered band gets thinner towards the pouch side. This has profound effects on its performance. Compared to an untapered band with the same rubber mass, you have less draw weight, but can shoot the projectile at a higher velocity! 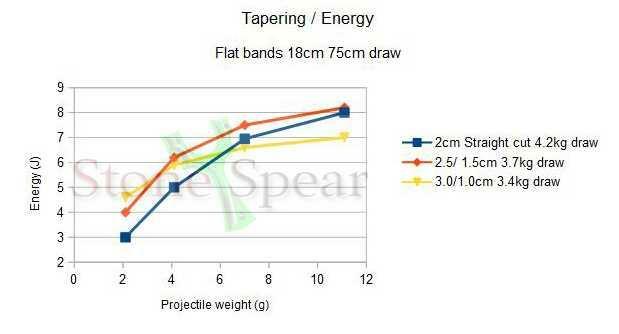 As a rule of thumb, you can say that the lighter your projectile and the stronger your bands are, the higher should your tapering ratio be. The downside of tapering is its negative effect on band life, though a light tapering (in the region of 2:3) does not affect it enough to worry about. Conclusion:A mild tapering with a ratio of about 2:3 is always a good thing. 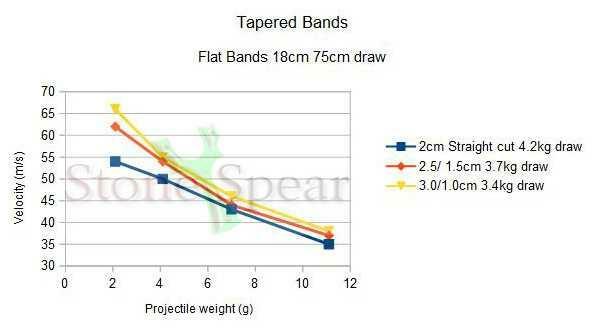 More drastic tapering makes sense if you want to shoot relatively lightweight ammo with strong bands. How long should your slingshots' bands be? This may be the most important question in choosing your band setup. The longer your bands are, the less they have to extend (as long as you keep a constant draw length). Less extension means a much longer lifespan. On the other hand, performance does dramatically increase with shorter bands. This is especially true if you want to shoot lightweight ammunition at a high speed. Typically, the band length - without the length needed for band attachment on fork and pouch - is between 18% and 25% of your draw length. Longer bands will have a dramatically improved band life, with up to 2000 shots being not unusual. Shorter bands may live just a few hundred shots, but will give you the velocity you may need for long-range shots or hunting. So choose wisely. That being said, if you extend rubber bands to the absolute maximum, where you feel ythe bands cannot extend any longer, your velocity will actually decrease, and your bands won't stand this torture for long. Different band shapes have a different performance. It is difficult to provide precise data on this subject, as the band's material is just as important, and one inevitable ends up comparing apples to oranges. What can be said, though, is that smaller, flexible bands with a higher surface generally have a better performance, especially with lightweight ammunition. Large tubular bands also seem to lack in performance, a possible explanation is that air is trapped inside the tubes, and causes trouble during the rapid. 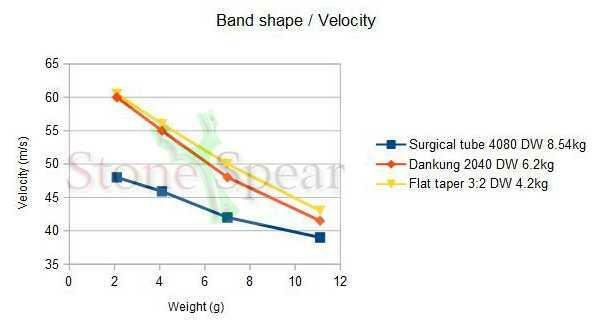 The graph shows three bands. One is a commercial untapered tubular band. The second one has dual small-diameter chinese-style tubular bands, while the third bandset has tapered flat bands. 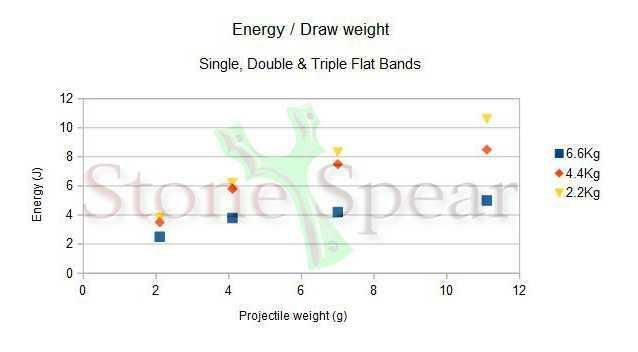 Please note that I'm audaciously comparing apples to oranges here, as the band have such a different draw weight, tapering, band material, and even a different extension ratio! I want to show you how much your slingshot's performance changes with different band setups.